Writ on Water has returned with a new ep of two older songs and four new songs. Don’t worry if that description makes it sound like this is a disjointed ep of leftover tracks – A Charcoal Night sounds like a cohesive whole project rather than a b-sides collection. Whether that is talent or intention or both, I will leave up to you to decide. For the two older songs, there is “Wicker” in its original arrangement, and a studio recording of “Windsor” – a song which had originally been demoed for The Greyest Day. Despite the time between releases, Writ on Water never seems to lose a step. They can still write (and record) moody, ethereal alternative rock. For example, the first new track, “Twenty-Three,” starts off with a two minute instrumental intro full of intricate interplay between instruments that oozes more atmosphere and feeling than many bands do in an entire album. I’m also glad that “Windsor” finally sees the light of day again – it was originally on The Greyest Days Sessions disc… I always liked it way back when that album was available. 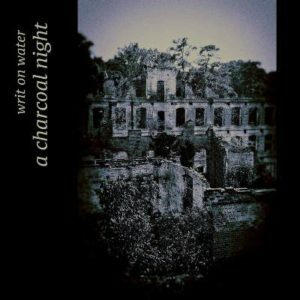 If you are a fan of Writ on Water, this ep is another great addition to your collection. If you are not a fan but like deep, moving alternative rock, carve out some time to give this ep a listen. This one is a serious contender for my top albums of 2017 list. Also for fans that have not heard yet, Writ on Water has an exclusive song called “Placate” on the Opus Zine compilation Twenty Years and Counting along with Sam Billen, the Revolutionary Army of the Infant Jesus, Caul, and many more – don’t miss that one as well. Want to get reviewed here? Have a CD, BandCamp page, book, video, etc we need to check out? See the Submissions Page for more details and guidelines. Listed below are the recent updates. To see a full list of all bands, artists, writers, etc., see the Review Directory.